I'll admit that I've spent precious little time with Wye Oak's music in the past. Then I had the chance to leisurely delve into Civilian, the forthcoming third album from the Baltimore-based duo, and it opened a whole new world for me to experience. Experience is the appropriate words from my perspective, because that's really what Wye Oak songs are, experiences. The arrangements are often sweeping in nature, but it's really the juxtaposition between the gorgeous melodic vocals and the often dissonant music that elevates this tracks. It's truly a case of the whole being greater than the sum of the parts. A slow-chugging bassline gives "The Alter" a forcefulness that is palpable, yet can not displace the vocals. "Hot As Day" explodes into sonic fireworks which are triumphant, but never out-of-place. The best example of this however, is "Holy Holy". The vocals waft in and hold strong as psychedelic guitars attempt to batter them about before trying to swamp them with overwhelming waves of sound. "Plains" is another standout. It's a hovering track with an apropos title as it seems to exist on it's very own astral plain. One can almost feel the song as it floats and vibrates along. 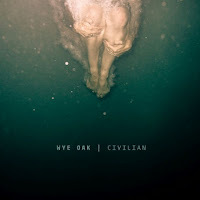 If you like your music to be dynamic and every changing then there may not be a better album for you this year than Civilian. The beauty-racked-with-chaos is something to be experienced. Wye Oak play the El Mocambo in Toronto on April 9th. Best tracks: "Holy Holy", "Plains"